As 2019 Begins, Beware! The Central Bank Narcotic Fix Will End! We are on the cusp of cataclysmic global market changes as the grand Keynesian experiment of endless deficit spending and unlimited quantities of money created out of thin air are about to end in tears. The big lie that you can magically enjoy wealth from money created out of thin air to pay for everything every human being on the planet wishes to enjoy is about to be exposed for the fraud it is. Endless monetary stimulus and artificially low interest rates have not only lead to the destruction of capitalism by an inefficient allocation of capital and overconsumption, but like any other narcotic, led to massive irrational thinking on the part of the global masses and policy makers. With the ability to print endless amounts of money, socialism, which inevitably leads to poverty, is the god of the ruling elite. That false religion is being taught in universities around the world, thus guaranteeing future global poverty. Sad but true, the only system that generates wealth, namely capitalism, is not only not taught, but the Left’s big lie is that it is an evil system. The pleasure of massive global monetary narcotics must, like any drug addiction come to an unhappy end because, low and behold, the laws of nature within the four dimensions of time and space in which we mortals live will ultimately prevail. As the chart above on your left reveals, starting in 2019, all of the monetary narcotic administered as a “solution” to the global financial crisis of 2008-09 will be taken away. 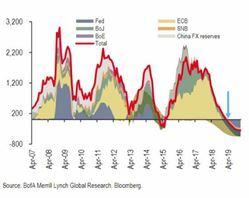 Even in 2018, as global QE has been in decline, global financial markets have begun to display withdrawal symptoms. Now let’s look at some financial realities that are about to bite the global economy with a vengeance. The massive borrowing by the U.S. Treasury is crowding out emerging markets’ capital flows. Global financial repression caused by massive monetary QE narcotics over the past decade has resulted in a shortfall of funding in the U.S. because investors were chasing yields in emerging markets. Now as the Trump budget deficit is running over $1 trillion per year even at the top of the business cycle, capital is flowing back to the U.S. leading to plunging asset values in emerging markets since April of this year. Not only do the Fed and other central banks have to fund rising deficits, but the U.S. Treasury and many other governments (Japan, England, ECB, Switzerland and China) will have to increase their borrowings as central banks are no longer funding debt rollovers. Pernicious as trillion-dollar deficits are, they are likely to get worse and the U.S. borrowing needs are going to explode for several reasons. First, the U.S. budget deficit is set to explode given the current total absence of any advocates of fiscal rectitude left in the U.S. Congress. Secondly, social security has now moved from surplus to an accelerating deficit given baby boomer demographics. Also, with the U.S. deficit now approaching $22 trillion a mere 1% rise in interest rates increases borrowing needs by $220 billion annually! A reasonable anticipation is an increase in the 10-Yr. Treasury to move at least 1% into the 4% to 4.4% range. For many years, the U.S. has been able to live beyond its means thanks to the kindness of strangers like Japan and China. But now for various reasons, which are long term structural in nature, they are actually reducing their holdings of Treasuries. For the 12 months ending in January 2018, U.S. Treasury holdings by foreigners fell by $166 billion. With QT (drug withdrawal) replacing QE (drug dosing) and with the massive deficits being run in the U.S., the global financial markets are facing severe headwinds. Emerging markets with heavy U.S. debt may be the source of the next global financial unraveling because with financial suppression destroying supplies of capital, the price of a diminished supply of capital must rise. Thus it is possible if not likely that interest rates may actually rise even after the next Keynesian-induced global depression occurs. In preparing for the next global financial crisis and the potential for a new monetary regime, you may want to do what many nations not friendly to the U.S. are doing, buy gold!